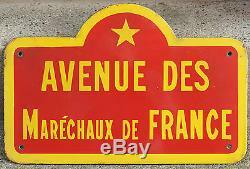 This listing is for a genuine French vitreous enamel on sheet steel street sign. Avenue des Maréchaux de France (Marshals of France). The Maréchal is supreme commander of the armed forces. This is from the port of Dunkirk (Dunkerque), the only town in France with a road so named. The colour scheme is very rare in France and is occasionally found in the area round Lille. Lies flat - ie no rim or flange. Please see similar rue des Poilus. The item "Old French enamel steel street sign road plaque plate Avenue Marechaux de France" is in sale since Friday, February 16, 2018. This item is in the category "Antiques\Architectural Antiques\Signs". The seller is "frantique2000" and is located in Yorkshire. This item can be shipped worldwide.